Wave goodbye to the Mobile-First era. Artificial Intelligence (AI) is now all the rage. AI will soon spread everywhere: from mobile apps becoming smarter and smarter, through objects with distributed AI, to data analytics that goes far beyond predictive capabilities. Every company in every industry is under pressure to figure out how the magic of AI will disrupt its business. Nevertheless, we should not hurry to wipe the slate of the past clean. The Mobile-First era underlined, among many other things, how important APIs are for fuelling applications with data. After all, with advanced and heavy analytic technologies reigning in today’s world, the value of APIs will be reinforced by the deluge of connected things that will soon spill data over us. As we jump in AI-First era, let’s explore how we can leverage AI insights from research labs to businesses to boost value extraction from data and optimize the outcomes of every decision. AI is on the brink of revolutionizing industries as diverse as banking, healthcare, aerospace, and manufacturing. Major providers of market intelligence such as Gartner or IDC agree the AI market is exploding. They predict AI will generate US$40 to 50 billion of business worldwide annually by 2021. They anticipate an AI tsunami will engulf the world: Asia on one side will see a CAGR of 74% from 2016 to 2021, and Occident on the other will see a CAGR of 45%. Data is everywhere and accessible. You can expand AI beyond narrow uses cases and solve more valuable challenges. Data is rich and explained well through semantics, enabling a paradigm switch that transforms data into knowledge. We have broken the ‘AI speed barrier,’ and intensive Machine Learning is now at hand for every business. While there is now more buzz around AI than ever, AI has been at stake for almost 60 years (Figure 2: algorithmic maturity). In the early stages, algorithms were simply “I repeat” capabilities. These have progressed over time. Today “I learn to learn” algorithms allow us to create ever smarter machines, even ones that can learn by themselves. The next generation “I contribute, I exchange” algorithms will make distributed AIs cooperating a reality. They’re already there in the most advanced research labs. 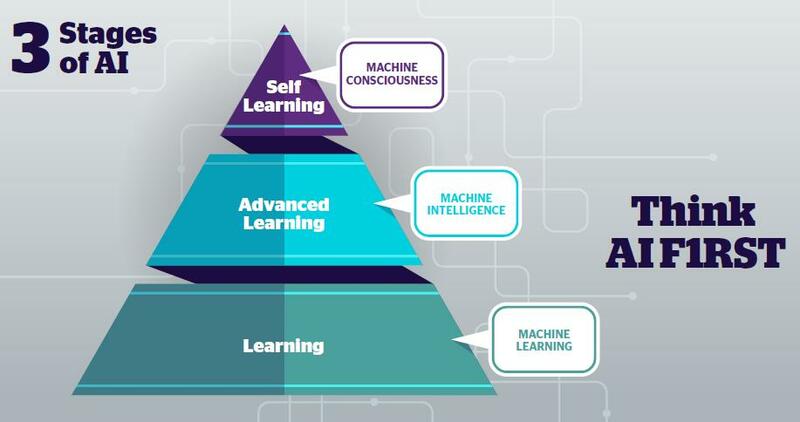 Industry today boasts its own specific AI implementation model: Machine Intelligence (MI). But take a step into the future to discover an advanced version of this model. We call it the ‘Machine Intelligence Brain Model’ (Figure 3: Machine Intelligence Brain Model). The model’s Perception Layer allows machines to understand their environment. It applies a first processing to information arising from various sources, including sensors that gather structured and unstructured data to make them accurate and reliable. The ‘intelligence’ lies within the Cognition Layer where complex algorithms combine to deliver the specific Machine Intelligence sought. 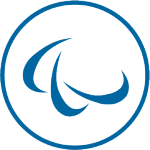 This Cognition Layer prepares the knowledge and understanding required for decision making. The Decision Layer has all it needs to get the job done. Its forward-looking decisions take context into account, with those decisions influenced through the Anticipation Loop. Finally, the system’s Memory stores all the data gathered, enriched information accumulated as knowledge, and algorithm models. The Brain Model allows Machine Intelligence capabilities to be architected as a stream of services with weak or narrow dependencies. Each step can be optimized and improved independently. The more accurate the Perception Layer, the better the model can infer the importance of contextual detail in the Cognition Layer, for instance. 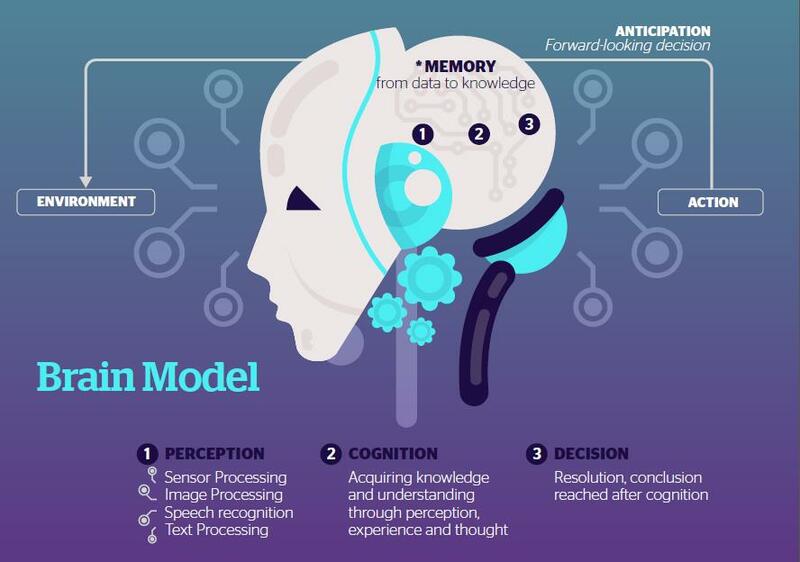 We have already applied the Brain Model to various use cases such as anomaly detection, stream context processing, chatbots, cybersecurity, video security, and fraud in payment. Mastering an AI development model is not enough. The infrastructure and tooling are at stake too, as we highlighted in the three key factors. 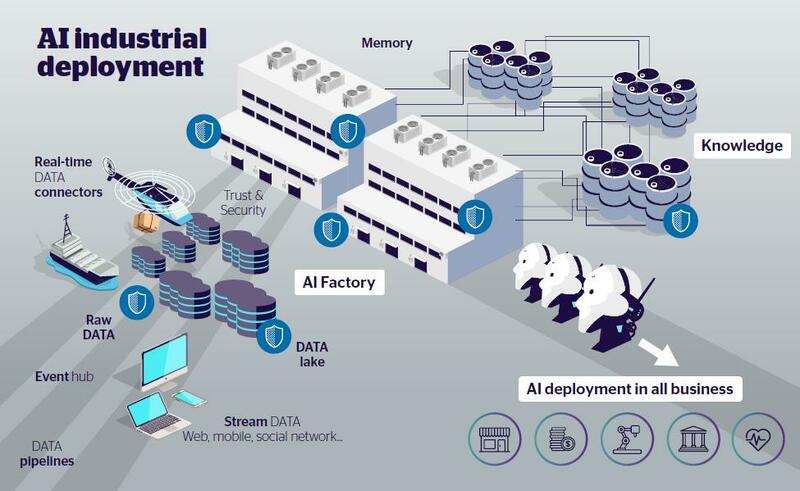 This leads us to another challenge: making industrial deployment of AI capable solutions a reality (Figure 4: AI industrial deployment). Deploying the MI system into business applications with the appropriate level of reliability and trust. Nevertheless, you don’t have to imagine the age of Machine Intelligence. It’s already here, just ahead of Machine Consciousness. And you? 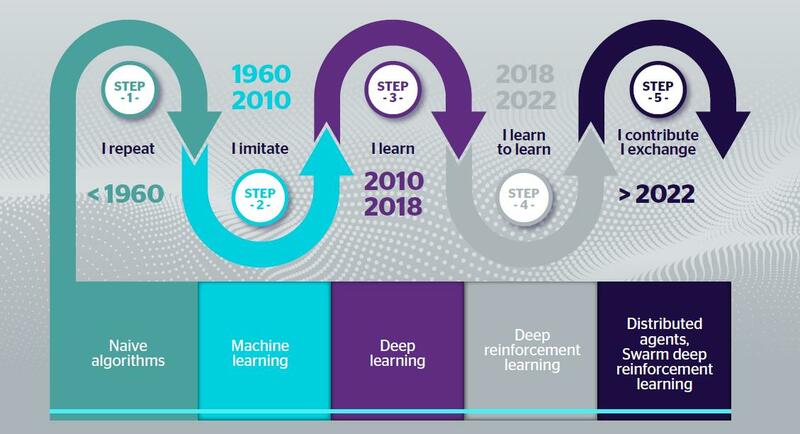 Are you ready to jump into the ‘Era of AI’? Eric is Vice-President, Head of Machine Intelligence at Atos. He’s responsible for solidifying new technological and business directions for Big Data Global Business Line. Eric’s career has been mainly built on numerous R&D positions in several companies, with experience in leading 100+ people organizations and managing large projects in international environments. Eric’s best memory is the first Supercomputer Bull delivered CEA end 2005 and which was ranked number 5 worldwide. He was in charge of this multi tens millions Euros project on behalf of Bull R&D: technical presale, design, development and on site bring up. Eric is a technology-minded person who values wide range of skills and technological knowledge focused on customer wishes to turn them into reality. Guillaume Lefebvre is currently Head of R&D User eXperience Department in Worldline. He has 17+ years of experience in innovation and Research & Development. An expert in user interface technologies, he investigates all kinds of new customers experiences to develop new online services for Worldline customers. Guillaume has worked on innovative concepts around new web technologies, Social Networks, chat bots & conversational agents, connected TV, Cross Channel & mobile uses, and new digital journeys thanks to mobile, tablet, camera, wearable device, digital signage, physical web, and Internet of Things technologies. Can Intelligence be Artificial or can Artificial be Intelligent?